It’s that time again. 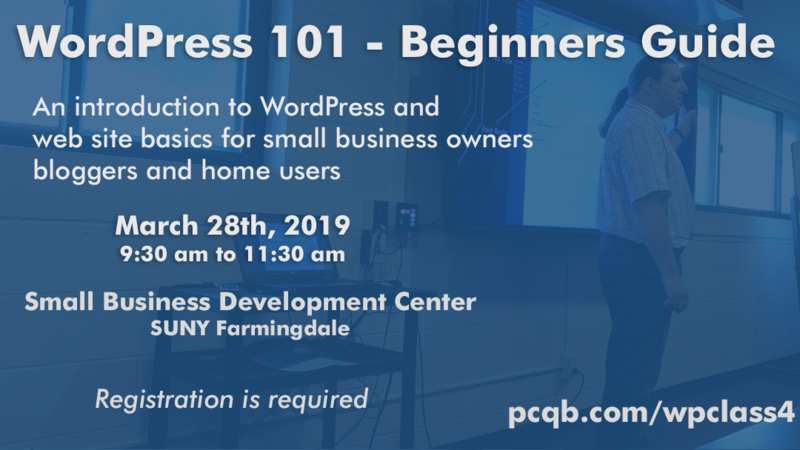 I’ll be teaching my WordPress beginners class at the Farmingdale Small Business Development Center (SBDC) on March 28th, 2019. This class is an introduction to and an overview for using the WordPress content management system for a business website. Topics covered will include an overview of WordPress itself: how it works and its advantages and disadvantages, a discussion WordPress.com vs WordPress.org, what you’ll need to get started, how to set up your site and get it online, how to navigate the complex ecosystem of WordPress themes and plugins and how to pick the right ones. It will also have a basic introduction to navigating the WordPress back end, making posts, creating pages, keeping your site secure and understanding categories, tags and other WordPress taxonomies. Registration for this class is $10. To register, visit the Farmingdale SBDC workshop page and look for WordPress 101 or click the registration link here. The workshop will be held at the SBDC Conference Center at SUNY Farmingdale. Directions can be downloaded here(PDF).